After noticing some frustrating inaccuracies with the high-resolution world coastlines and national boundaries database found in worldHires from the package mapdata (based on CIA World Data Bank II data), I decided to look into other options. Although listed as “depreciated”, the data found in NOAAs online “Coastline Extractor” is a big step forward. There seem to be more up-to-date products, but this served my needs for the moment, and I thought I’d pass along the address to other R users. I exported the data in ASCII “Matlab” format, which is basically just a 2-column text file (.dat) with NaN’s in the rows that separate line segments. 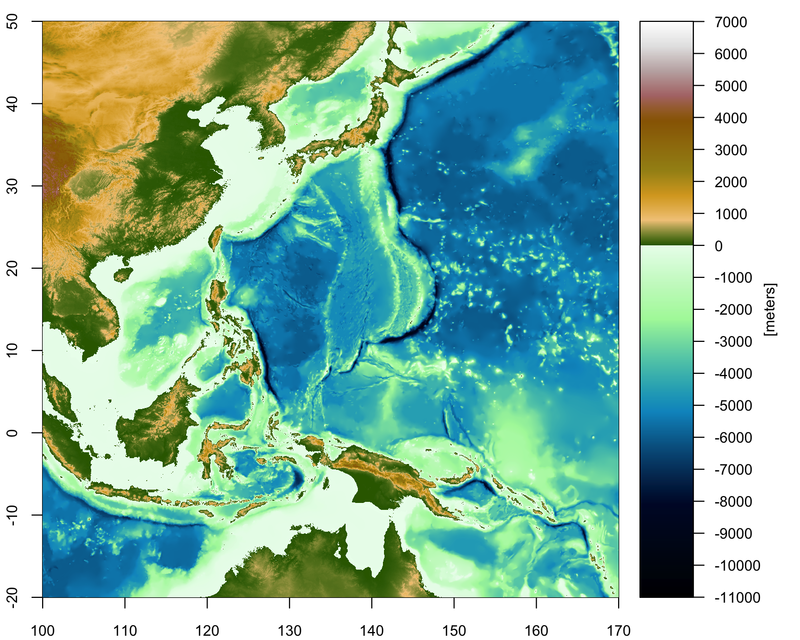 I’ve also discovered the bathymetry / topography data from GEBCO. Again, very easy to import into R from the netCDF files. The above map of the Galapagos Archipelago illustrates the quality of both datasets. 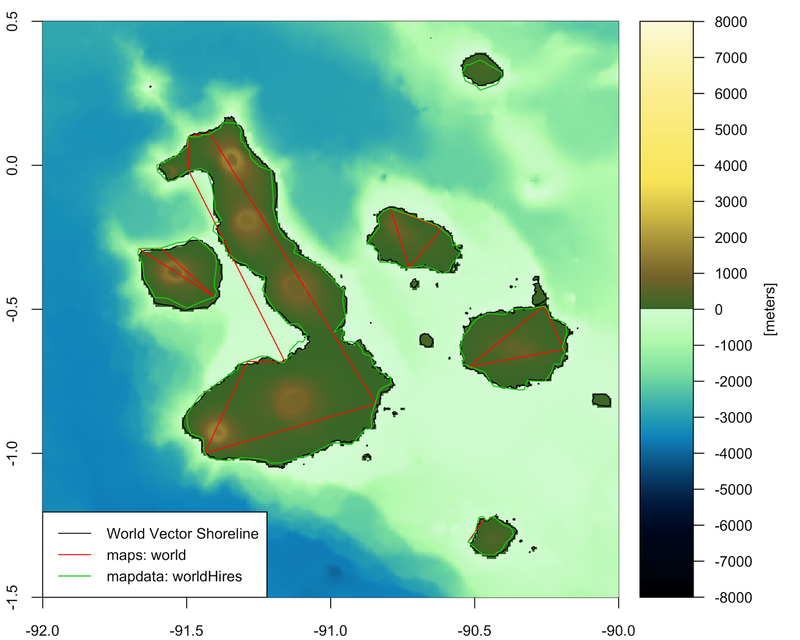 It also shows the comparison of coastline accuracy between World Vector Shoreline (1:250,000), world (map package), and worldHires (mapdata package) datasets. Obviously, the low-resolution world data only makes sense for quick plotting at large scales, but the high-resolution data is as much as 1/10° off in some locations. I noticed these errors for the first time when trying to map some data for smaller coastal bays. It drove me crazy trying to figure out where the errors were – in my data locations or the map itself. Bathymetry used in the map was 30 arc-second resolution GEBCO data. For both maps, I took inspiration for the color palettes from GMT. The rgb color levels of these palettes have got to be documented somwhere, but I gave up looking after a while and managed to hack their levels from color scales contained in .png files [link]. Below is the R code to reproduce the figures.